The Moscow State Conservatory is considered to be the heart of cultural Russia. For the whole world, the Moscow Conservatory – along with the Bolshoi and Mariinsky Theaters, the Hermitage, Moscow Kremlin – is a symbol of the great Russian art. The world's leading music university was founded in 1886 by the pianist and conductor Nikolai Rubinstein. Music theory was taught by young Peter Tchaikovsky, the Piano class was conducted by Joseph Wieniawski, the brother of the famous violinist Henryk Wieniawski, the Violin Art was taught by Ferdinand Laub and the composer Ludwig Minkus, the author of the immortal ballet Don Quixote. Hector Berlioz, who visited Moscow Conservatory on its first year, was amazed by the possibilities of the university and told the musical world about the birth of a new phenomenon in the Eastern Europe. The true treasure of the Conservatory are the concert halls: the Small, Rachmaninovsky, Myaskovsky and Great Hall, one of the most famous in the world. Excellent design, convenient location and – most importantly for musicians – great acoustics achieved it the deserved title of the best concert venue in Moscow and Russia. 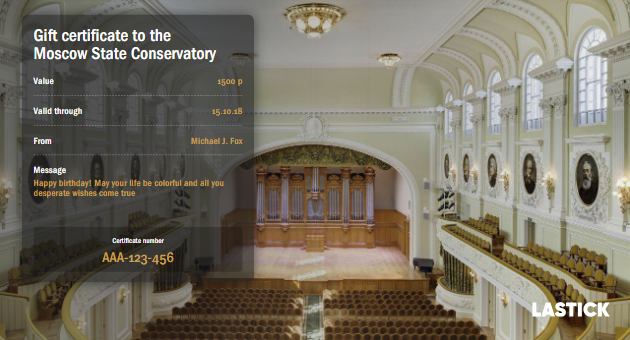 In 2006, the Corps of the Great hall (the main building of the Moscow Conservatory) was named after the founder of the Moscow Conservatory N.G. Rubinstein. The main concert hall of the Conservatory is decorated with a wonderful organ of the Parisian firm “A. Cavaille-Coll" made in 1899, which was recognized at the Paris World Exhibition (1900) as one of the best organs of the world.